The zookeeper claims that the allegations are a lie, but the pictures speak for themselves. A zoo in Cairo, Egypt allegedly tried to pass off a donkey as a zebra by painting black and white stripes on the animal. 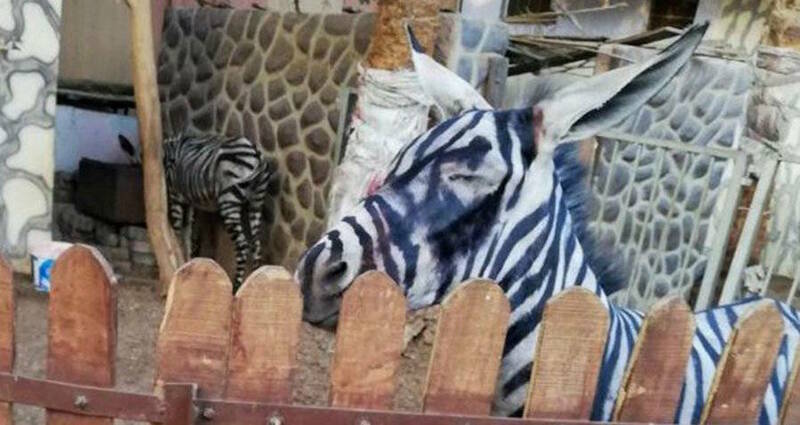 Mahmoud Sarhan was visiting the animal sanctuary at the International Gardens Park in the Egyptian capital when he noticed that the “zebra” looked a little suspicious. There are a couple of giveaways in this photo that show this animal is a donkey and not a zebra. For one, its ears are much larger (and longer) than that of a zebra and form a sharper tip at the end than zebras’ ears typically do. Zebra’s manes also send to be a lot fuller than the one that’s seen in the picture that extend all the way to the top of the forehead. This animal’s mane seemingly begins much farther down the line, closer to its back. And then there’s the fact that the alleged paint appears to be smudged on the side of the “zebra’s” head — a dead giveaway that this zebra is an imposter. Despite all of this overwhelming evidence, zookeeper Mohamed Sultan denies allegations that the zoo painted a donkey to look like a zebra. This isn’t the first time that a zoo has come under fire for faking zebras. In 2009, a zoo in Gaza also allegedly painted two donkeys black and white to look like zebras in an effort to replace two actual zebras that had died of starvation. A reason why both the Cairo and the Gaza zoos allegedly tried this is because zebras digestive systems requires it to eat a lot of food. Because of this less efficient digestive system, as Wilson says, zebras “compensate by eating more food” than animals that have more efficient digestive systems. Because zebras require more food, it might cost zoos more money to keep them well fed and healthy. On average, a zebra weights about 600 pounds and is able to eat 10 pounds of grain and 20 pounds of hay per day. That adds up to 210 pounds of food per zebra, per week — and this is just on average. Larger zebras presumably require a larger quantity of food to survive, which in turn costs more money for the zoo.